The Feral pigeon originated from the Rock dove, it is around 33cm in length and common in urban environments. 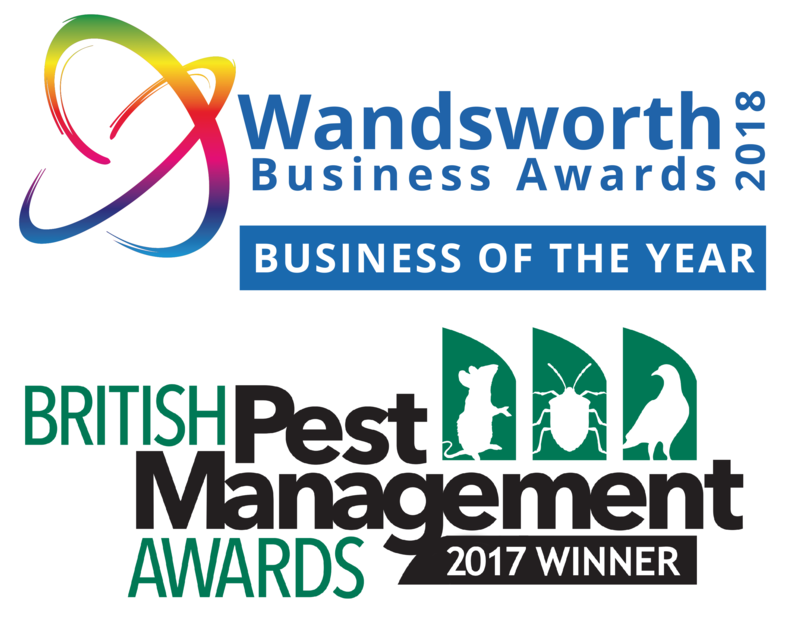 We have our very own dedicated Bird Control London team who are employed by Beaver Pest Control London and they are ready and able to work nationally. Many pest control companies subcontract pigeon proofing work which can only add to the cost. We will provide you with a free site survey and quotation after discussing the best bird proofing system for you. We specialise in Avishock, Bird Free Gel, pigeon netting, sprung wires and pigeon spikes plus many other bird deterrent systems. Health and Safety for pigeon proofing and bird control is paramount and we are fully trained in the use of all forms of access equipment. Click here to find out more. Feral pigeons can breed throughout the year; two eggs are usually laid with incubation lasting around three weeks. Fouling of buildings can be both an aesthetic problem and, due to their acidity, also destructive. Bird droppings can block gutters and pipes; they can create a slip hazard and can lead to an insect infestation in buildings. Feathers and the dust from pigeon droppings have been associated with asthma attacks. Salmonellosis and ornithosis are connected with pigeons. Bird fleas and bird mites can lead to further problems for humans. 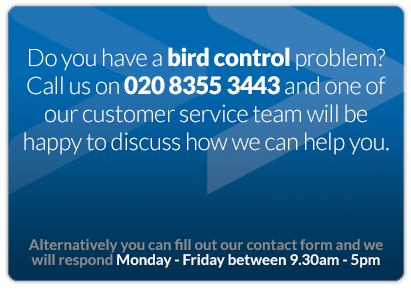 Our promise is covered by a guarantee for your bird control London problem and all pigeon proofing is carried out in a safe, professional and effective way. We will carry out your pigeon proofing work in such a manner as to cause minimal disruption to you, the public and any other people on site. When you contact us you will be offered a FREE SURVEY, a written quote, a method statement and a site specific risk assessment. With your assistance the most effective and least obtrusive bird control London system will be chosen for your paticular requirements. 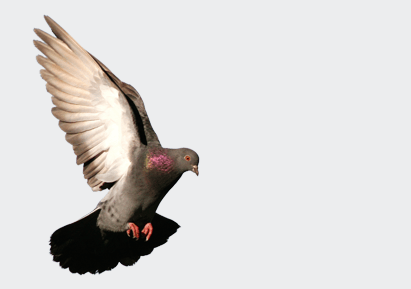 We can offer you a wide range of solutions for all of your pigeon and pest bird problems. Whether you own a domestic property or manage commercial or industrial sites within London or nationally. We have the answer for you. Pigeons build relatively flimsy nests – often using sticks and other debris – which may be placed in trees, on ledges, or on the ground. 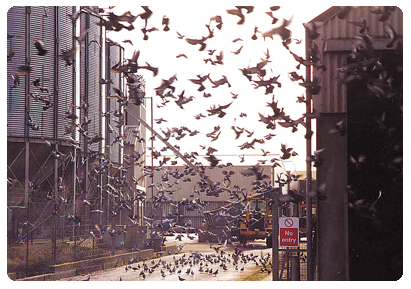 Our bird control London team will help you decide on the best way to sort your pigeon infestation. The European herring gull (Larus argentatus) is a large gull (up to 26 in (66 cm) long). 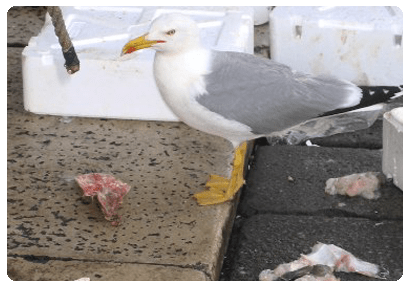 European herring gulls are also abundant around inland rubbish dumps, and some have even adapted to live in inland cities. Our bird control London team have the answer for this bird species too.